Hey, Nickel Slots fans! You’ve seen our first two music videos, for “The Devil’s Chain Gang” and “On the Wall.” We had a lot of fun making them with Jason Knight, Sean Kime, and their team. Now we’re about to shoot our third, and we need your help! 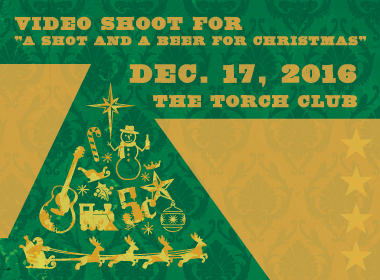 We’re making a video for “A Shot and a Beer for Christmas,” the original song on the holiday EP we released last year, Christmas With The Nickel Slots. The video will be set in a holiday party at the Torch Club with the Slots playing, and we need partygoers to dance, drink, and have a good time. We’ll buy your first drink and provide some snacks to keep you going, and then after the shoot ends we’ll actually play a set for you! Does that sound to you like a great way to celebrate the holidays? We thought so. Here’s what to do: come to the Torch Club (15th and I Streets in Sacramento) on Saturday, Dec. 17th at 4pm dressed up for a rockin’ holiday party. Not an ugly Christmas sweater or an elf costume: just look sharp and, if you like, add a Christmas touch. We’ll mime along to the recording of the song several times so that the video crew can get lots of footage to work with, and you’ll look like you’re having a killer time. Shouldn’t require very serious acting skills, and will probably take a couple of hours. RSVP to our Facebook event and use it to round up some friends to party with you! Like any other room, the Torch has a maximum capacity, so if you want to be a part of this experience make sure to get there early. We like our holiday parties full, but not fire marshal worthy.